Well this entry has turned into something of a saga so you had better make yourself a cup of tea and get comfortable. I set off at lunchtime on the wednesday and had a pleasant, gentle journey across country to Oxfordshire. The weather was fine and, after depositing my equipment in the Printmaking tent, I drove to the campsite and found a patch of ground at the higher end of the field - a good decision, as it happened. As you can see, my '76 VW camper isn't the smartest looking vehicle but it has character. The refit had cost more money that I could really afford but I spent five very comfortable nights in the van. I walked back to the Printmaking tent - a sizeable marquee - and started to arrange my things. Ten hours of rain! Here is the morning view from inside the camper (which amazingly no longer leaks), accompanied by Radio Three. Meanwhile, in the Printmaking tent, the water rises! ...and the ground starts to turn to mud! However, by the end of the day, the inside of the tent was ankle deep in mud! We arriveed to find the situation no different and so decided to sort it out ourselves. Printmakers are such capable, practical people. Laurie (collagraph and etching), Chloe (lithography) and Nana (traditional and modern Japanese printmaking) are seen here bringing in the first barrow of straw. Many other barrows followed and we covered the floor. The whole tent had (for now) and pleasant, comforting rural aroma - rather like a dry barn or stable. Saturday was a surprisingly good day, culminating in a marvellous meal served up for the artists and craftspeople who had been demonstrating at the event. When the tent was opened on Sunday morning, the smell was enough to take the back off your throat; the mud-soaked straw had produced the unmistakable aroma of cowshed! All in all, and despite the weather, Art In Action was extremely enjoyable. I couldn't have hoped for more cogenial companions than the other printmakers. I enjoyed demonstrating engraving and also sold a pleasing quantity of prints. Without hesitation, I would recommend Art In Action to anyone with an interest in arts and crafts. 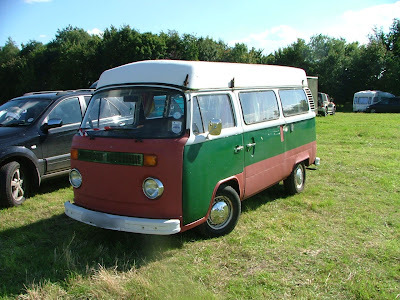 I'm off to Art In Action, having worked all hours under the sun and the moon to refit the camper. Check out my last post to see the "before"... this is the "after"
I have packed just about everything except the Albions (there is one there in the printmaking tent). I'll report when I return. And here is a general view of the space. The paintings on the right are by Sue Rapley, holding her first exhibition. Apart from being a fine painter, Sue is also great company. It would be great to see you if you attend - do drop in and see me in the Printmakers tent. NOT really suitable for an engraver of a certain age and so, dear reader, I am also working every hour under the sun and the moon to refit it. 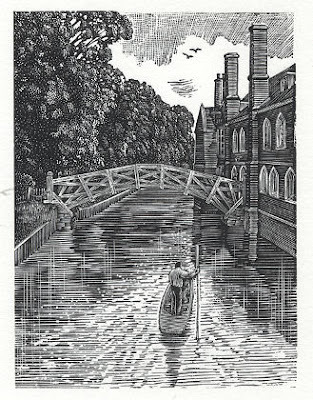 I have finished the engraving of the Mathematical Bridge that crosses the River Cam in Cambridge. This is a good time to take a break, pour a nice strong cup of tea, and look at the image with a critical eye. I work through the print systematically, noting all of the changes and developments that I wish to make. Its been a while since I followed the story of an engraving on my blog and so here is an offer for my readers only. I am selling five of my artist's proofs in my website shop at a much reduced price of GBP25.00, including shipping. This is about half the selling price for the edition. Please note that these are artist's proofs - identical to the selling edition but marked "A/P" instead of the edition number. They are for sale HERE as Item "Blog Special No. 1"